Galette des rois, because it's (almost) Mardi Gras time! As some of you know, I unintentionally moved to New orleans in the fall of 2014. I came to make all the jell-o molds and casseroles for the ABC network miniseries The Astronaut Wives Club. I have so many things to say about that experience, because it fundamentally and permanently changed my life. I started a new career, met my husband, and ultimately left Los Angeles behind, which is something I never thought would happen. I was a ride or die Angeleno - a beach-loving, sun-tanning, yoga-doing, machine, fueled by vegetarian burritos and alkaline water. But then I met New Orleans. Since this is where my husband lives and works, there wasn't any question I'd be coming along for the ride in his place of residence. And thank God I found love in one of the greatest, most interesting cities in the world - a deeply weird, food-obsessed, genuinely historic, totally unique, full of the nicest people place I have ever had the privilege to home. New Orleans is a modern city that gives every appearance of operating on the same calendar as the rest of the world, but don't be taken in. New Orleans has it's own schedule that is demarcated by festivals, parades, and most of all: particular FOODS that belong to that moment in time. Which brings me to galette des rois, or king cake. In broad strokes, there are two kinds of king cake. One of them is a yeast risen, bready type of thing, and the other is made with laminated pastry dough. The first one is the category that the popular New Orleans style King Cake belongs to, and apparently hails in it's original form from Southern France. Our local version is basically a giant brioche cinnamon roll covered in gooey glaze and sparkly sugars in the Mardi Gras colors (that's yellow, green, and purple for those of you unacquainted with Mardi Gras traditions), and it's good - especially piping hot, and with a cup of coffee for breakfast, because everyone knows cake is a breakfast food, right? I'll probably try my hand at cracking that code later in the season. Season? What season, you ask? Carnival season starts today! It ends on Mardi Gras day, or Fat Tuesday, which means we have roughly two months to stuff our faces with king cake until Lent happens, and king cake is outlawed until next year. But don't worry, many local churches host giant fish frys for the Lenten season, when the city of New Orleans drowns it's collective post-carnival blues in deep fried catfish with all the sides. (Here's this link from 2014 in our local newspaper so you get how real food traditions are here). But back to cake. The other kind of king cake is galette des rois, which translates to - you guessed it, "king cake." But this is the Northern France kind, and from what I can see, here around town, using the French name means you'll be getting this version. It's a very simple cake - just almond pastry cream inside puff pastry, but man is it delicious! It's a flaky, buttery, almond creamy dream, like a giant almond croissant in cake form. 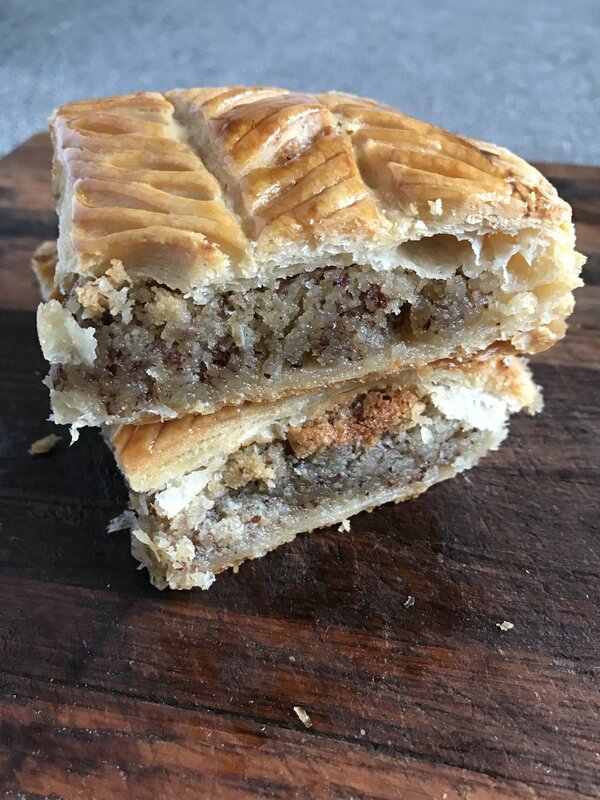 More importantly, since you can buy puff pastry pre-made, it's almost as easy as making pigs in blankets from tinned biscuit dough. Epiphany (January 6th for all you non-catholics/people who live somewhere else) is also day the Krewe de Jeanne D'Arc has their parade, where they'll bless the king cakes for the start of the season. It's tradition to bring king cakes to share at the end of the parade route, so I made individual mini cakes, as well as medium sized ones for slicing. This recipe is for two smallish (in the neighborhood of 8") full size cakes. If you go wild like I did, and instead make small cakes and medium cakes, and just totally non-standardize your route, you may find you have extra things like pastry cream, and puff pastry, but that's not so bad is it? If you make two 9" cakes you may have just the right amount of cream, or if it's looking thin, stuff some jam or preserves in there. Life is all about flexibility right? And cake. Because there are some rules to puff pastry, and since I went off road and made mini cakes with the leftover pastry and cream, I did something I don't usually do, and took a handful of process pictures. There are lots of instructions here, but 85% of them are about how to roll, cut, and press your cakes together. This isn't so much a cooking lesson as a step-by-step cake building set of instructions that results in a crunchy buttery explosion in your mouth. So, without further ado, let's get flakey and celebrate Jesus (or Carnival) with cake! preheat oven to 375 degrees when you plan to bake your galette. Make the almond cream. Combine dry ingredients and zest. Mash the butter in - using your hands is easiest, until it's fully incorporated. Then stir in the eggs, one at a time, and add the extract and rum or flower water. This is not a smooth silky mix, but it should all be well incorporated like s sticky batter. Use a stand mixer if you like. Cover and chill until use. Unwrap your puff pastry. Place a large piece of parchment paper on a good surface for rolling. Carefully unwrap the puff pastry, being sure not to force it flat along the creases. If you cram-jam it flat you'll tear the dough, which isn't unfixable, but it's better not to do. If necessary, gently unfold it and let it rest a minute, then unfold it again. The butter in the dough will soften, and it will smooth out with no tears if you go slow. Once it's fairly flat, sprinkle well with flour. Roll it out. Smoothly, and evenly roll the creases out of the puff pastry. Because we let the dough warm up to let it settle, it will be a bit tacky, but this is what your flour is for. This step shouldn't take long, and you shouldn't need to flip the dough like a pie crust. Once it's big enough for your circle template to accommodate 2 circles (top and bottom) you're done. Cut your cake top and bottom. Use a template of your choice. A springform pan bottom, or a bowl turned upside down (I used the dog's food bowl - I swear I washed it first). All that matters is you have enough dough to get 2 circles. 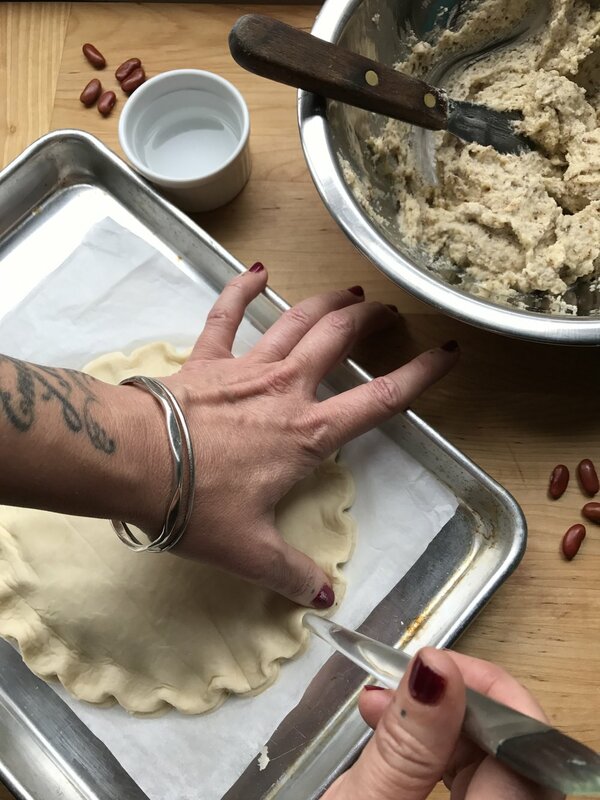 Place your template on the dough and trace around it with a knife, taking care to cut through the dough, but not tear the paper underneath or put undue pressure on the bowl sitting on the dough. Transfer your top and bottom pieces to a sheet pan. DO NOT pick up the dough - we are going to lift using the paper only. First, gently lift and un-peel the dough scraps you aren't using. Set aside - do not throw away! Wrap it in plastic and put it back in your refrigerator. Cut the parchment rolling paper in half leaving one circle on each half. Lift the papers individually and lay them on a sheet pan that will fit in your refrigerator. You can lay the 2 sheets of paper on top of one another, stacking your dough, if you like. Cover and chill your dough for 30 minutes. It's not a bad idea to pop the first circle into the fridge and let it chill while you are cutting the second one. Fill the cake. Remove the dough and almond filling from the refrigerator. Set aside the second circle of dough leaving only one circle of dough on parchment in the baking sheet. 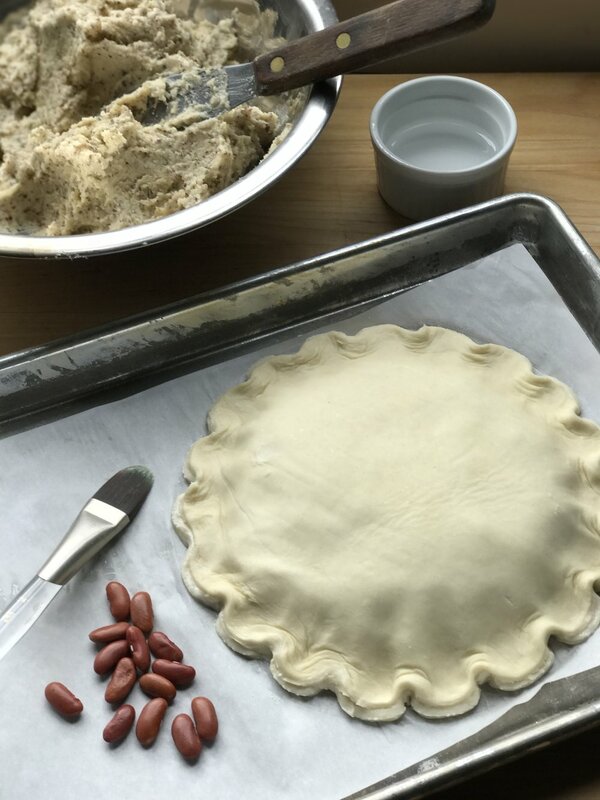 Spread almond filling over the center of the dough, leaving one inch uncovered at the edges of the circle. If you care to, you can add a layer of jam or preserves under your cream, or just dollop some on top. Place a fève (prize) inside if you like. Take care not to pile your filling too high, or you may have a hard time sealing the edges of your cake. Close her up. Brush water generously along that border you left the filling off of. 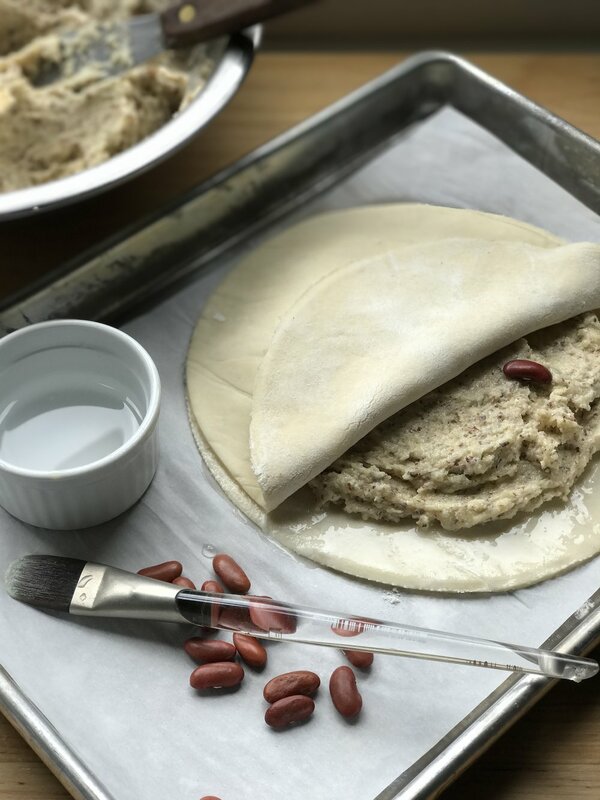 Take the second circle of dough from the refrigerator and carefully un-peel it off of the paper and place it over the top of the filled dough. Press down along the edges of the cake to seal it well. Press with your fingers and flute with a knife - see pictures. Go ahead and make a little well with your fingers when you press. It will look like a flower now, but it puffs up and turns back into a circle as it bakes. Place your unbaked cake back in the refrigerator to chill again if you plan on decorating the dough. It can stay there overnight if that's better for you. Decorate! Using a paring knife, score the top of the cake gently to make patterns in the surface of the pastry. You can cross hatch, make a wheel, whatever you want. Take care not to cut too deeply or your cake will cleave along your cuts when it bakes. Cut 5 or 6 vent holes to allow for steam to release while baking. Cut them along your decoration lines if you decorated. Glaze it. Carefully brush egg wash over the top, being sure not to let the wash dribble down the sides, or it will impede the sides from puffing up. This is where those little finger wells come in handy to catch your excess egg wash.
Bake it. Bake for 30 minutes or until brown on top and sides. Keep an eye on it as it bakes, as it may require extra vents cut if it isn't able to release enough steam. Once it's baked, let it cool on a rack. It will deflate. Serve warm or at room temperature. Your almond cream will largely mirror the look of your almond flour. I used Trader Joe's brand, which has a nutty, flecked look, and so my almond cream looks nutty and flecked. If creamy and smooth is important to you, search for an almond flour that is extra fine and all one color. Feel free to reduce the sugar content, but not by too much as it does loan some of the structure to the filling. 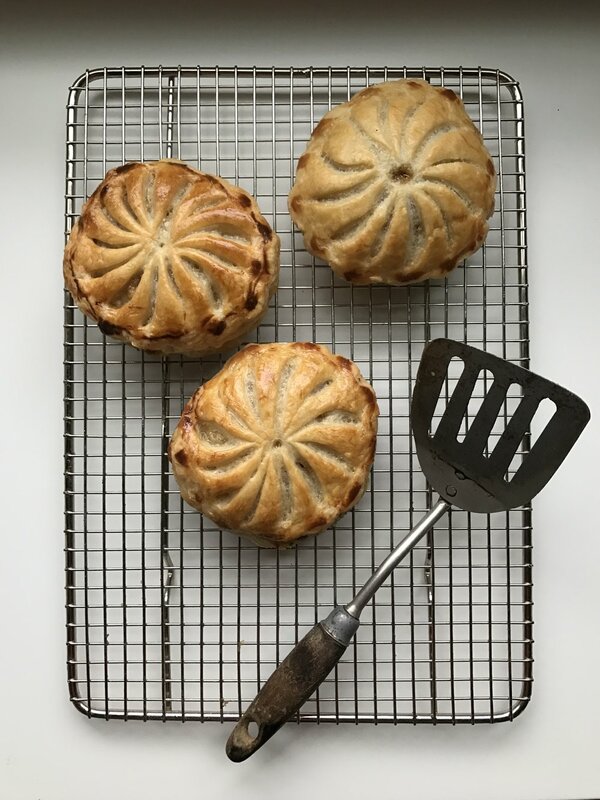 Generally speaking when we work with pastry dough we should work fast and keep re-chilling the dough, because when pastry dough warms up it gets rubbery and less forgiving. While you should shoot for this gold standard, don't worry if you find you aren't very good at perfection. Honestly this is a very forgiving cake, and the worst that will happen is your circle wont be perfect. 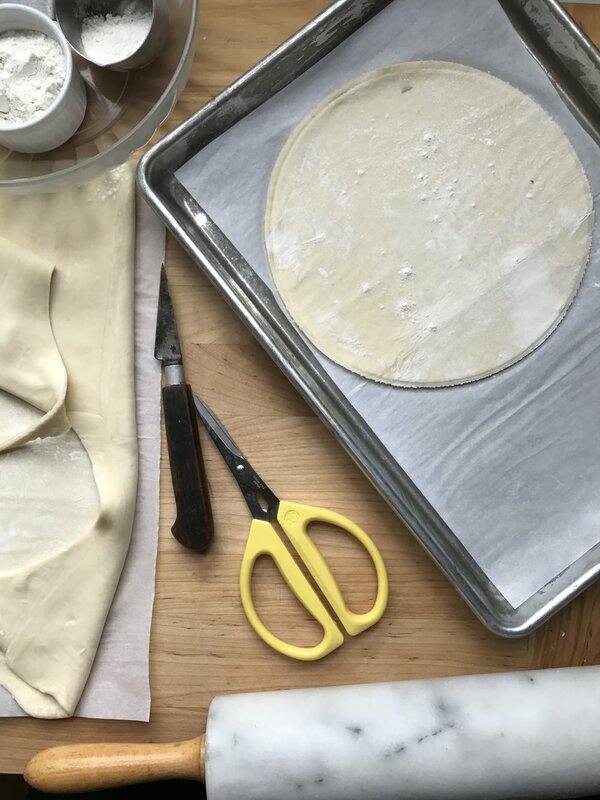 If you're having an OCD day and want that perfect circle, then chill your dough regularly, work very fast, and be careful when you roll it out that it doesn't have time to warm up. Otherwise, who cares? Your elliptical cake will be delicious. 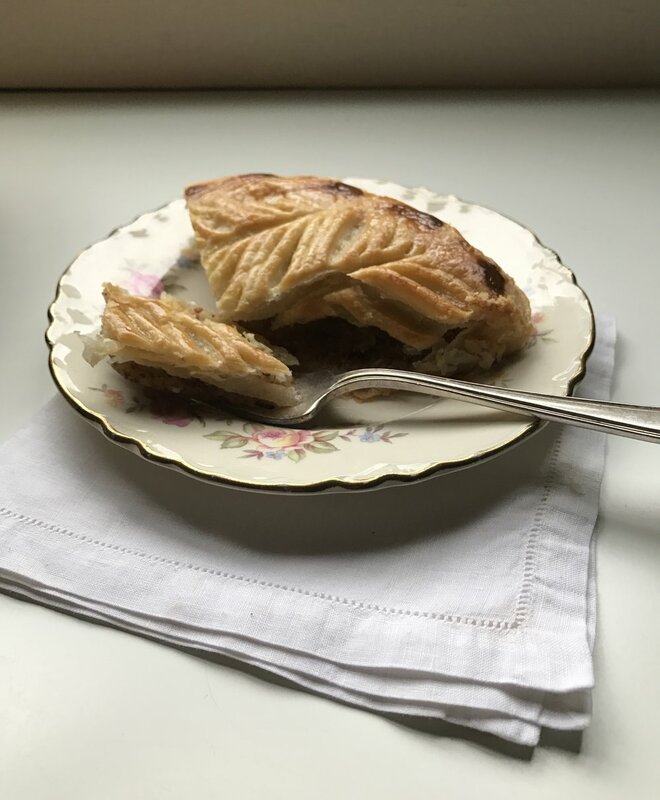 I use Dufour's puff pastry because it only has butter and flour - no weird stuff. You can generally get it at Whole Foods in the freezer section. Do what the box says and thaw it in your refrigerator. If you're like me, and like to make a lot of different sized circles, and you want to experiment with adding jam and different flavors, do! This cake is very simple, and has lots of room for rose water, second filling layers of jam, sprinkles of nuts, whatever! Go crazy. I wont think your nuts if you make an Oreo cookie crumble galette des rois. If you do, PLEASE let me know about it. Getting to that DO NOT THROW AWAY your extra pastry dough comment. This stuff is kind of expensive! And honestly, it improves everything. Wrap it around hot dog pieces for the best pigs in blankets you ever had, or just cut it out with cookie cutters and make tiny cakes filled with your extra pastry cream or jam or cinnamon and sugar or chocolate chips. I mean. whatever. You can also freeze your extra dough in a well wrapped package covered in saran wrap. But who are we kidding? It'll be gone in a week. On fèves (prizes): use them inside if you want. I used a Camellia brand red bean, because New Orleans. Just be sure whatever you use that it wont break teeth, or melt into toxic poison. Also, you should tell your guests there may be something inside, lest they break teeth or gag. You can buy really awesome little porcelain fèves in New Orleans, and it's custom here to use a miniature baby. That's baby Jesus, mmmkay? You can use plastic if you're game to jam the little sucker in through the bottom after you've baked it, but I don't recommend this option, even though it's what the big companies do around here for liability reasons (when you buy a king cake in New Orleans it comes with a baby on the side for you to put in yourself). If you do use a fève, the tradition is that the winner is king for a day and provides the next king cake. If you screw up any part of this recipe, it totally doesn't matter. If your cake comes out oblong, or your filling explodes out the sides, or it only puffs up on half the cake, or your cake cracks in half because you didn't vent enough IT DOESNT MATTER. This will still be so delicious that everyone will forget about all of that when they bite into a flaky, dripping with butter, almond freak-out. Is it really 2017? Already? BBQ Meatloaf, no grilling required.